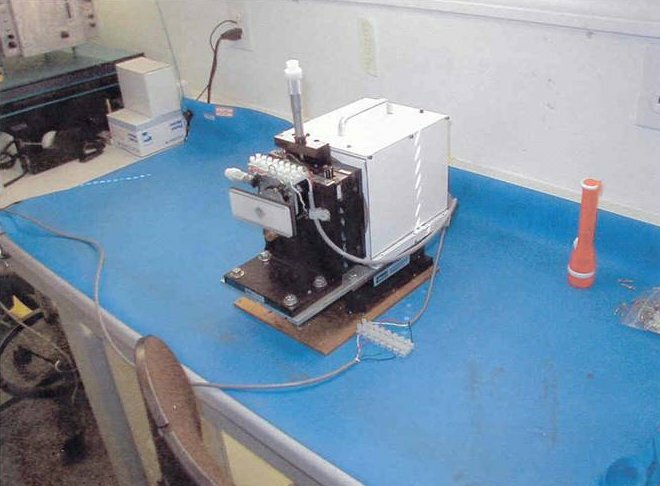 The RAVIN-SL5 temperature calibration unit (TCU), mounted on the RF head. The TCU is a unique feature of the RAVIN-SL5 radio telescope. It allows direct calibration of the recorded antenna temperature while observing a target. The TCU is controlled directly from the telescope control panel. A three position switch allows selection of the target signal, the ambient temperature, or an automatic repetitive sequence between the target signal and ambient temperature. It is particularly useful for rocket plume measurements during the launch phase, since it provides a direct measurement of the sky noise background temperature over the extent of the launch profile, prior to launch. When used with the remote focusing unit (RFU), it provides a direct measure of aperture focusing and efficiency, using the moon as a target. TCU and RFU capabilities are essential to the accumulation and analysis of short term phenomena, typical of rocket launches and kinetic kill events. Credit: Photo courtesy of Doc Ewen.